Whoa, where did this one come from? I've always considered Steve Freund to be one of the better unsung guitar players on the scene today. But he never showed more than passable vocal skills on his previous solo discs. 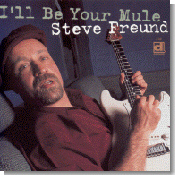 I'll Be Your Mule is a quantum leap forward for Freund, and should catapult him up a few levels in the blues hierarchy. Freund's vocals on this album possess a richness not heard on his previous releases, immediately audible on the opening slow blues "I'll Be Your Mule." This number, as on many of the following cuts, showcases the excellent piano accompaniment of Mark "Mr. B" Braun, a recording artist in his own right. At the risk of going overboard in my praise for Freund's vocal work, he almost sounds a little like Magic Sam on the energetic B.B. King shuffle "Fine Lookin' Woman." The slow number, "Hung Down Head," is highlighted by the work of a solid horn section as well as hot blues guitar from Freund. Kenny Smith's primal rhythmic drumming, Freund's rawer guitar and Harlan Terson's nasty bass playing come together on a fine original instrumental, "Fittin' To Go." My favorite cut is the double-entendre novelty shuffle "You Were A Good Old Ride," with great lines like "...you need way too much work, darlin', I ain't gonna ride you no more..." This is a good example of creative songwriting from Freund. Fellow Delmark artist Dave Specter contributes a tasty guitar solo in the middle. Another guest artist, harmonica player Steve Guyger, contributes nice harmonica on the original shuffle "A Dollar A Mile," a song detailing the ever increasing "out of pocket" expenses incurred by musicians in traveling to their gigs. Freund plays some fine guitar licks on the New Orleans-sounding "When I Was Young," with Mr. B also playing a big part in the success of this number. Veteran Chicago session man Bob Stroger lays down a solid bass groove here. "Bill Reed's Blues" takes the listener on a complete turnaround, as it sounds like a slow, late night jazzy blues from an earlier era. Freund, Mr. B and soprano sax player Clark Dean all get the chance to solo on this relaxing number. My hope is that I'll Be Your Mule is the spark for Freund to put together a touring band and hit the blues circuit. All of us blues fans will make sure he gets his "dollar a mile." Check out this CD, and I'm sure you'll agree.